Full aluminum strength and 3-section packability for snowshoeing and mountaineering in variable and rugged terrain. 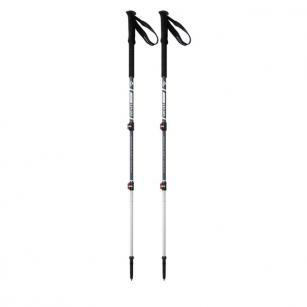 The DynaLock Explore Pole offers 3-section packability and the reliable strength of full aluminum construction, making it a versatile pole for snowshoers and mountaineers tackling everything from local hikes to distant expeditions. The pole’s dual DynaLock mechanisms offer a full range of length adjustment, along with the confidence of tool-free tensioning—which allows the clamping force to be adjusted on the fly. With both powder and trekking baskets, DynaLock Explore poles are primed for all-mountain, all-season exploration.